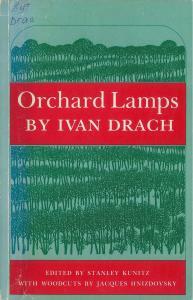 Orchard Lamps. Edited and introduced by Stanley Kunitz. With woodcuts by Jacques Hnizdovsky. Translated by Daniel Halpern, Stanley Kunitz, Paul Nemser, Mark Redman [sic, i.e. Rudman], Paula Schwartz and others. Toronto: Exile Editions, 1989. 71p. illus.